VIRGIN GORDA–With injury knocking St. John’s Timothy “TJ” Hindes from seeking to 3-peat, the door was wide opened for a new champ to be crowned. 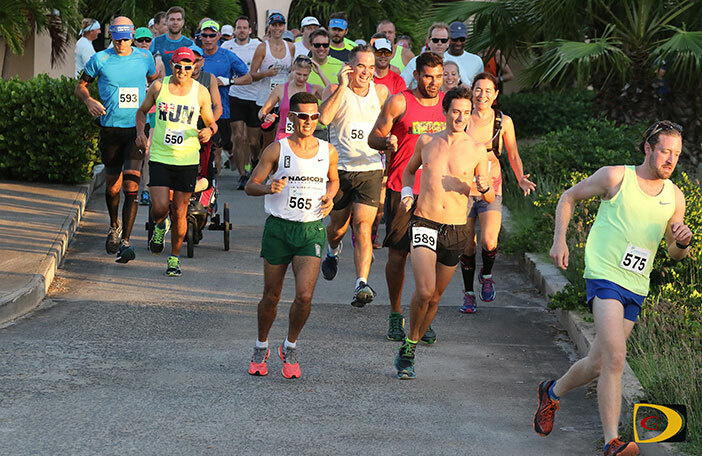 And for a moment during Saturday’s 5th Virgin Gorda Half Marathon, Vincent Fournier thought he’d given home turf advantage to Tortola resident Ruben Stoby, who opened a sizeable gap. Fournier said that eventually near the Coppermine Road on the southern end of the island he noticed he was making an inroad into Stoby’s lead, which gave him a big boost. Stoby said it was a good cat and mouse race and after seizing the lead, he thought Fournier had fallen off the pace for good. Frequent visitor Ryan Blanchard of Richmond Va., who’s getting married on Virgin Gorda this week, ran the race with his fiancé Andrea Sorlie. He’d hope to finish in under two hours and did 2:13.10 and his fiancé, 2:35.46. “I ran it all last year but I walked up the big hills this time because I knew where they were,” he said. Top Half Marathon Finishers. Men: 1. Vincent Fournier, 1 hour 35 minutes and 24 seconds. 2 Rebuen Stoby, 1:35.59. 3. Guy Williamson, 1:44.49. 4. Jacques Roux, 1:48.08. 5. Rodrigo dos Santos, 1:51.56. Women: Maria Mays, 1:52.16. 2. Melissa Brunner, 2:00.17. 3. Rebecca Paul, 2:01.32. 3. Kim Tackeuchi, 2:10.24. 4. Claudia Ferrari, 2:10.35.5. Mellisende Rowe, 2:12.20.